James Nasmyth was the last of the great man of the Industrial Revolution. In future, as the machines themselves become more and more complicated, developments of machines would be made by many companies rather than by individual man. Much of this work took place in America, probably because there were not so many skilled men available for work as in Britain, so machines had to take the place of man. The american firm of Brown and Sharpe was one of the leaders. The specially shaped milling cutter was one of their development. Just a whitworth had the idea of standard nut and bolts, so Brown and Sharpe brought in this idea of standard thickness of wire and sheet metal. They also developed new types of grinding machines. The firm was also famous for the milling machine. 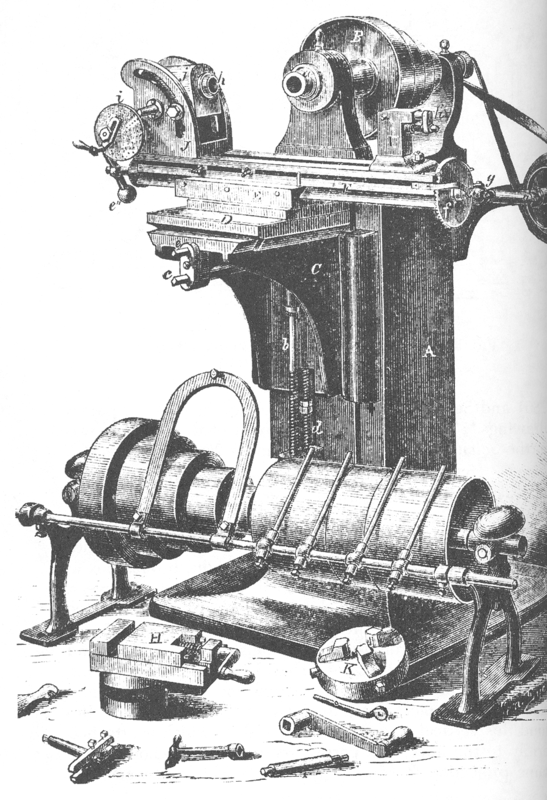 It was called a universal machine because the clever design of the work holder made it possible to cut metal at any angle. The knee carrying the work table, with up and down adjustment, was also great improvement. It was originally designed for making twist drilles, but had many other uses as well. Many improvement were made in America in the design of lathes. 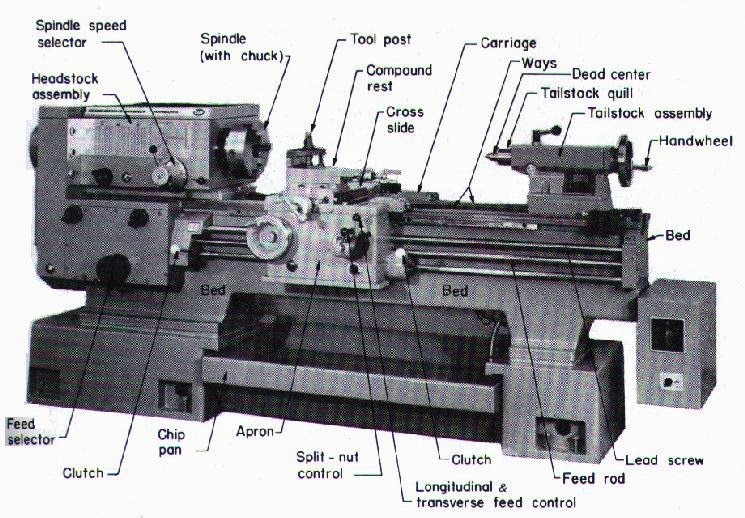 The back gear of the lathe was replaced by proper gear box, so that it was much easier and quicker to choose a new speed for the lead screw, and the pulley giving only 4 spindle speeds was also replaced by a multi speed gear box. Another development was the capstan lathe, in which the tool holder could hold 4,6, or 8 different tools, and could be turned so that could quickly be brought into action one after other. The capstan lathe developed into the "Automatic" lathe. Originally called "Automatic screw cutting machine", automatics are now used to produce all sorts of small components form long bar of metal. This is fed in, clamped at the right position, and worked on by various tools in the turret, until the component is complete. It is then cut off from the bar, which moves forward ready for the next component to be made. All these actions, and the necessary changes of speed and so on, are controlled automatically. All the operator has to do is to feed in new bar when one has been used up, and to remove the finished parts. Setting up the machine correctly is very skillful job of course. The development of the small electric motor meant that each machine could now be fitted with its own motor, instead of being driven by pulley belts from overhead shaft. I have been browsing online greater than 3 hours these days, yet I by no means discovered any fascinating article like yours.